Corey Paredes had to trade in his No. 52 jersey when he was moved from linebacker to running back. Hawaii freshman Corey Paredes was settling in for yet another meeting with the Warrior linebacker corps Friday night when he was told to report to the running back meeting. By yesterday morning, his green No. 52 jersey had been traded in for an un-numbered white jersey and Paredes was the new guy in the running back drills. "It's a big jump," Paredes said after his first practice as a member of the UH offense. "It was pretty intense. It's just the different type of drills catch you off guard." Paredes' move, though it caused him some ribbing from the Warriors defensive players, added some depth to a running back group that had seen its numbers shrink. David Farmer attended yesterday's practice walking on crutches, but thankful his knee injury suffered on Thursday was not worse than a sprain. "It could have been worse, so it was good," Farmer said of the diagnosis. "Hopefully I'll just rehab and I'm planning to be back in a few weeks." Daniel Libre also took part in drills yesterday after observing most of the previous two practices. Leon Wright-Jackson continues to take the first-team repetitions. Although Paredes had gotten comfortable playing linebacker since joining the UH program as a redshirt last year, offense isn't foreign to him. He was a two-way standout at Castle High School as a linebacker and receiver for the Knights. "I've handled the ball before; it feels good and natural," Paredes said. Paredes said he isn't sure if he'll be a permanent figure in the running back meetings, but for now, "I have to learn a whole new playbook," he said. Receiver Royce Pollard, who had been working on the right side of the formation, practiced on the left side yesterday, backing up Greg Salas. "He's been steady, and we're trying to give everyone a chance. At least for now we're giving him a shot there at the X," offensive coordinator Ron Lee said. Malcolm Lane had a solid week of practice and is running first at the Z receiver on the right side with senior Nathaniel Nasca now backing him up. "He's fast and he knows what we're doing," said Lee, who's been impressed with Nasca's progress since moving over from slotback. Lee said the team will likely take eight to 10 receivers on this week's trip and is considering redshirting some of the junior college transfer receivers. 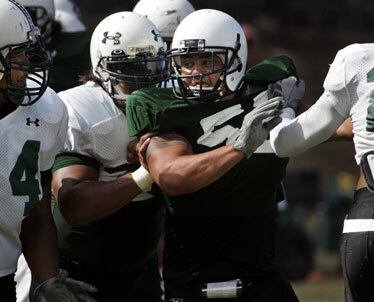 The Warriors roster will expand when classes on the Manoa campus start tomorrow. Coach Greg McMackin said about 15 players will be added to the roster. The additions won't have long to practice before the team leaves for Florida. The Warriors have morning practices tomorrow and Tuesday before departing later that afternoon.